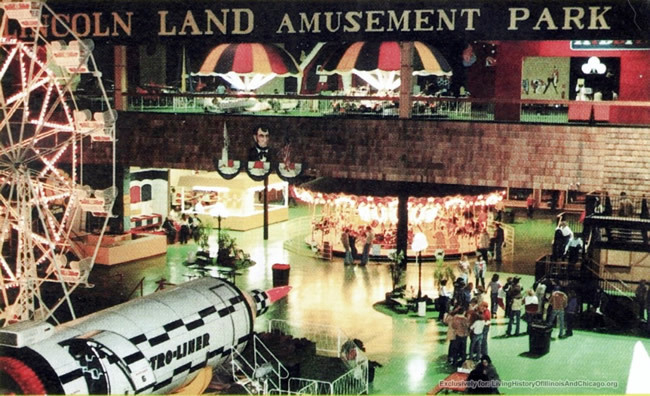 I was three or four years old when my family would occasionally visit L-I-N-C-O-L-N-L-A-N-D.
Lincoln Land was, at the time, the (self-proclaimed) largest indoor amusement park in the world. Located in Effingham, Illinois, it was less than an hour away from my hometown and I was young enough that my mom was able to spell out our destination in order to truthfully answer my "Where are we going?" query without giving away the surprise. I was also young enough that I pronounced it "Wincoln Wand." People had to walk through a long corridor from the Effingham mall to get into Lincoln Land. I'm guessing there was probably a direct entrance somewhere on the exterior but we always went through the mall. There was a rocket ship that you could ride. Dark inside the rocket, a screen in the front would show your path as the rocket moved as though you were actually traveling through the sky. There was a performance stage in a small auditorium room near the rocket ship ride. I recall seeing a magic show there. 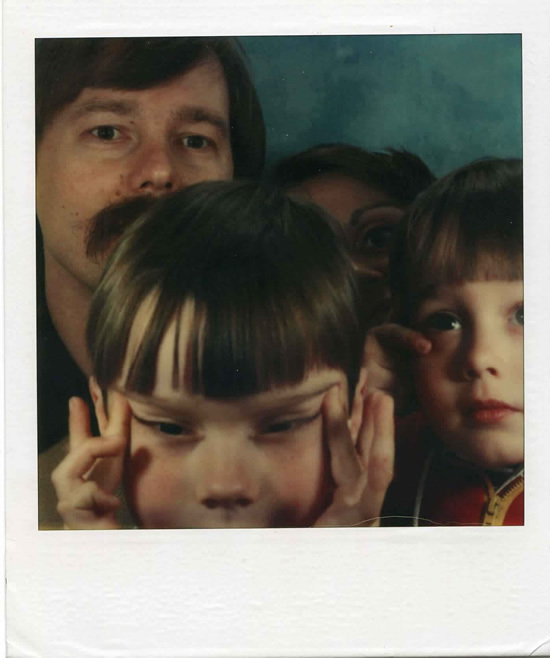 I have only one single piece of evidence that Lincoln Land ever existed which comes in the form of a photo booth Polaroid picture of me and my family taken there sometime in the late 1970s. I've searched the internet high and low looking for anything to spark my Lincoln Land memories -- a poster, a snapshot, anything. But I've always come up empty. I've learned many times over that once you stop looking for something, that's when you'll find it. On a whim, I recently decided to give another shot at a Google search for "Lincoln Land Effingham" and I about went through the roof when a few legitimate results were returned. None of this "Land of Lincoln" stuff I'd been faced with many times in the past. This was legit Lincoln Land. Apparently, someone from the website Living History of Illinois had tracked down an individual from the family that owned Lincoln Land and had acquired and added several images to their site under a section about Illinois amusement parks. There was the rocket. There was the Ferris wheel. I gazed at these images in amazement as I was immediately back at Lincoln Land. Even if just in my mind and only for a moment, it was like a whole section of memories had been unlocked in my brain and I was there. Lincoln Land, of course, is long gone. It closed its doors in the mid-80s and, as far as I know, the building is now used as office space. With confirmation that I hadn't imagined Lincoln Land, and as a lover of "stuff," I wanted more. I wanted my hands on something tangible from this place that I had visited a few times as a kid and countless times in my mind as an adult. 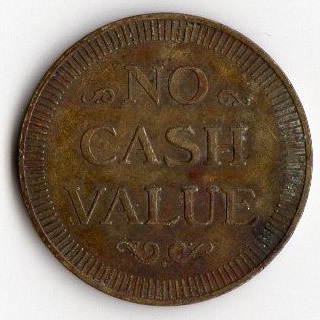 A quick eBay search later and would you believe that there was a guy out of Canada selling an original Lincoln Land token?!? Now I know this is a long shot, but does anyone else from that area during that era have any hard evidence of Lincoln Land? I'm guessing many people remember the place, but what about something tangible? If you've got any snapshots taken at Lincoln Land or any other memorabilia from back in the day, please get in touch! I'd love to see more! "I just love stuff. It brings joy to me." Be forewarned. This is going to be one of those self-indulgent posts that you probably won't care about one bit. After a pretty busy January and February, March has afforded me the opportunity to get out and do some long-overdue junk shopping. Spending next to nothing on all of what is shared in this post, I've been reaffirmed of something I've known for a long time. I got back to the flea market for the first time in several months and came home with a carded John Starks Starting LineUp. I already had this figure loose -- one that I bought on eBay several years ago because, well, John Starks is the greatest player of all time. Too bad the old masking tape price tag wouldn't come off without ripping the card. Still, totally worth the buck or so I paid for it. This same vendor had a ton of SLU figures -- both loose and carded. Patrick Ewing came home with me, too. For a few bucks, I couldn't pass up an unopened box of Yo! MTV Raps trading cards. There was no doubt I was tearing into these packs as soon as I got home and by the looks of the first pack I opened, I wasn't going to be disappointed. Turns out I was able to compile one full set (minus one card) as well as two more sets about two-thirds complete. My pal Wayne happened to have the one card I was missing so I swapped him one of the 2/3 sets for the missing EPMD card. Lastly, as always, a handful of Fisher Price Little People and a random record were also calling my name. Respect yourself. Bruno says so. Now let me tell you about this used book store in my town. Most of what they sell is sold online but they do have a brick-and-mortar "outlet" where they sell books that they don't feel would be worth their while to try and unload online. As someone who regularly buys things for dirt-cheap prices that I would never consider buying at full price (for example, the flea market purchases above), this book store outlet draws me in with their prices. Everything is a quarter. Everything. Profits from this store (online and through the outlet) benefit needy children in our community and beyond. Funny thing is, my church is currently holding a book drive where people can bring in their old books to be donated to this store. I hesitate to think about how many of these donations will ultimately end up in my house. On my first trip to this store, I came across a couple of early Sesame Street books that attracted me with some pretty cool artwork. With my set of original Hardy Boys books complete, I've since moved on to piecing together a set of the Casefiles books as I find them for cheap out in the wild. Additionally, I'm a sucker for Little Golden Books any time I see them. I was happy to find a few of each. Not only am I a sucker for Little Golden Books, any of the vintage Golden Shape Books are always a draw, too. And, of course, E.T. Who could pass up E.T.? Clearly, this was the kind of store I would be returning to often. And a week later, I did. Only this time, kids books and trade paperbacks were on sale -- six for a dollar. ...and the paperback movie novelizations. As if that wasn't enough, my whole family has been on spring break this week. My wife and I took our kids on a trip up the interstate to a children's museum we hadn't been to before and I convinced them to let me stop in a nearby town on the way -- a town I knew to have some pretty solid junk shops. At the first stop -- a place I visited last fall -- my wife quickly told me that I would be going in alone as she didn't care for the fact that the entrance to the place was a side door off an alley roughly spray-painted with the words "ENTER HERE." Nevertheless, this is my kind of place. Piles of boxes and shelves of junk -- all without price tags. If you see something you like, you ask the owner and he throws out a random price. You may recall my account of this shop from last fall when the owner sold me a bunch of Little People for a buck. I knew I could get a deal here and went in wondering if that Little People Main Street from last fall was still there. It was. And so was that "box of random blocks and baby toys." Looking closely, the box was full of stuff that I wouldn't want for myself, but I knew that if I could get the lot for next to nothing, I could easily make a small profit by piecing it all out and selling it online. It'd have to be for the right price, though. "Two bucks for the record. How 'bout three for the rest of it?" Five bucks for everything? Sold. So far, I've cleaned up and pieced out the toys from the box. I put together and have already sold a set of replacement pieces for a Tupperware Shape-O ball at a price that has more than covered the five bucks in spent in this store. Still plenty more in this box to be cleaned and sold so I'm sure to come out ahead. We stopped at one more place before leaving town -- the resale shop where I had picked up a pair of Atari 2600 paddles on that same day last fall. It should come as no surprise that I didn't leave here empty handed either. An Atari 2600 Space Age Joystick? Yep. A Fisher Price Little People Play Family Airport? Sure. A stack of Hardy Boys Casefiles books to add to my growing collection? Uh huh. Not a bad stretch over the past few weeks -- especially considering this year's yard sale season hasn't even begun. "I just love stuff...I light some incense, turn on some music, and just look at all the stuff. It brings joy to me." Many people have distinct memories of 1980s culture versus that of the 1990s. For me, the transition from one decade to the next had a specific name. As a semi-hyperactive kid of thirteen, I spent much of my time listening to the likes of DJ Jazzy Jeff & the Fresh Prince, Run DMC, and NWA. My 8th grade class was given the assignment of creating a product to present to the class in commercial format. Working together with my friend Scott, there was no doubt we were going to bring some hip-hop flavor to our product. It was called Dirt Cereal. Although a video recording of Scott and I dropping some serious talent on our classmates in commercial format does not exist, a one-man audio rehearsal survives almost thirty years later. As I've mentioned many times before, much like Adam Goldberg documented his childhood using a massive video camcorder, my brother and I have a lot of ours captured through a multitude of audio cassettes. Ladies and gentlemen, I present to you the 1989 version of myself...in all my hip-hop glory. "Hit is Scott!" was the signal for my friend to get crazy with a beat box solo. "Look out Weenies" refers to a rival product presented by a few classmates. Weenies was, of course, a Weird-Al-esque rip on Wheaties. This was a rural-Illinois version of Kool Moe Dee vs. LL Cool J as far as I was concerned. T42 was the name of our crew. Our commercial-making crew. We wrote this rhyme and knew we were destined for stardom. T42? Maybe, the T was for Tim? Possibly. Anyone know Jay-Z? I'm ready for a remix.